Special Occasions in our lives require special restaurants. 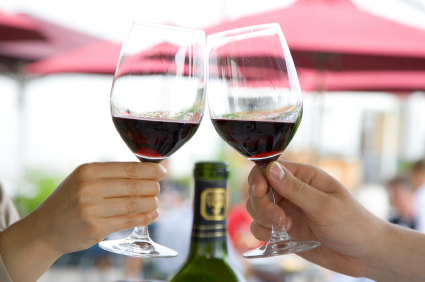 Job promotions, graduations, anniversaries, out of town guests, a key sales pitch, and other milestones demand an evening to be remembered, something classy and prestigious. Bowling Green has three in town and one out of town restaurant suitable for such an occasion. Their prices are a little higher, their menus a little more contemporary, their service a little more polished, and their kitchens a little more cutting edge. The architecture, decor and ambience are state of the art. 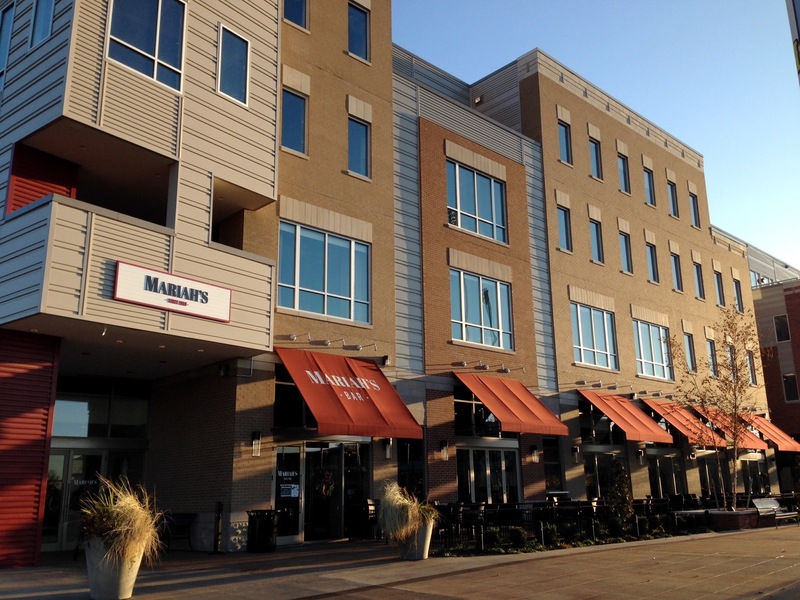 The downtown professional crowd eats lunch at these places, but they're more relaxed then. After 5 p.m. they get serious. 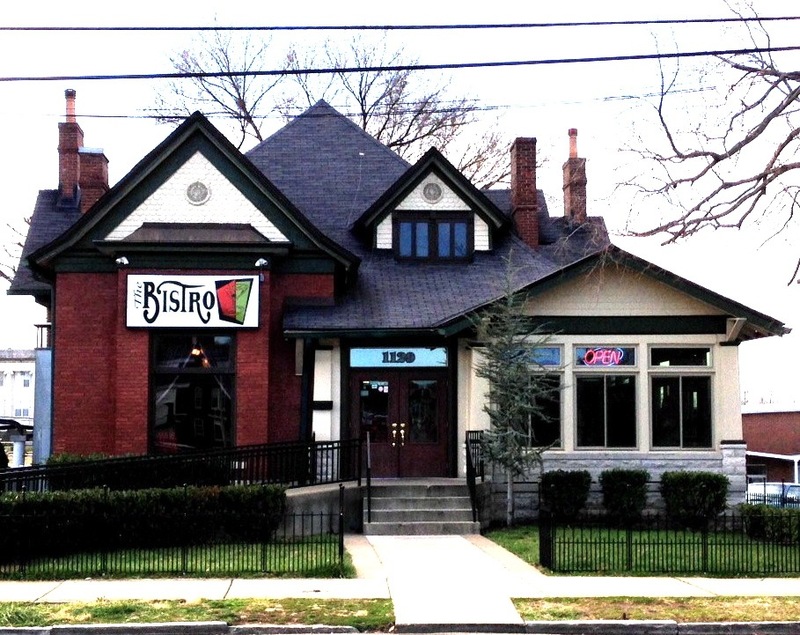 Bistro, Brickyard and York's are in the state's top 10 restaurants. The Brickyard Cafe includes The Garden. a semi outdoors patio type addition seen extending down the street in the photo at right. 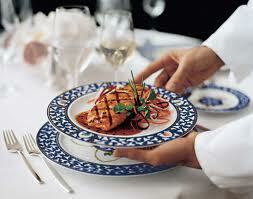 It features Mediterranean and Italian cuisine. 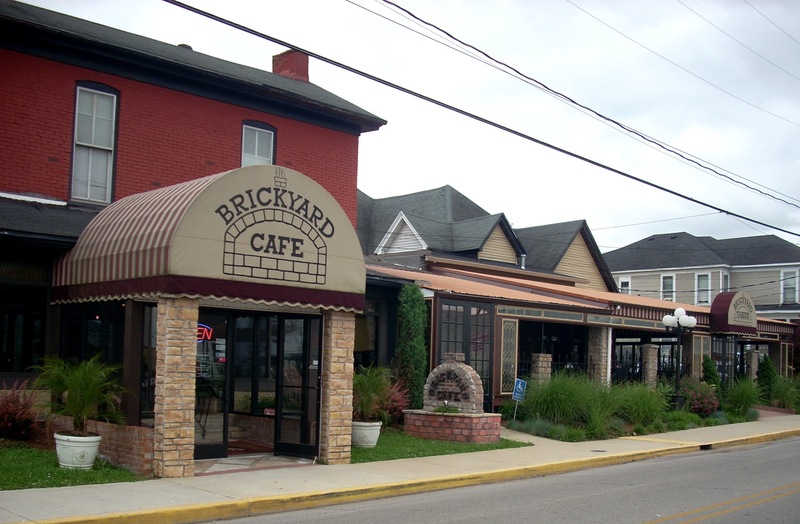 The Brickyard was created by Zeljko Simic and Robert Stupar, a restaurateur and baker in Bosnia and Croatia. They came here in 1995 to escape the war, bought the 1857 home in 1997, and spent a year renovating it. Of the appetizers, we like the Crab Cakes (served with chipotle aioli and topped with shrimp salsa) and Seafood au Gratin (shrimp, scallops, crabmeat, onions, peppers, celery, lobster cream sauce, monterey jack cheese and vegetable). Whatever their Soup of the Day, order a cup. Our experience has been it is always good. They offer four salads, of which we like the Greek and Mediterranean. The entrees present difficult choices. There are two steaks and Veal Marsala, Parmesan and Picatta. Chicken comes as Saltimbocca, Picatta and Blackened. They offer six pastas, of which we enjoyed the Prince Edward Island (steamed mussels over linguini in marinara), Voodoo (shrimp, scallops, mussels, peppers, onions and linguine with white wine cajun sauce), and Tortellini (four cheese tortellini with mush- rooms, prosciutto and sundried tomato sauce). There are also four pizzas. Mariah's is the Grand Old Dame of Bowling Green restaurants. We're still disappointed that they moved from their magnificent 1818 National Historic Register house, the oldest brick structure still standing in town. However, the new location in the HitCents Mall has a sleek, cutting edge, 21st Century ambience. They've kept most of the menu, including the Quesadilla (wheat tortilla stuffed with grilled chicken, jalapenos, cheese and chiles, toasted in a brick oven), Baked Potato Soup and Santa Fe Salad (greens, cheddar, jack, tomatoes, corn, chicken squares, black bean salsa, ranch dressing). They've added two salads for a total of seven. Among the Entrees, the Mahi is gone, but the Bourbon Glazed Salmon remains, plus five Steaks and the Pork Loin. There are eight Pastas, of which we recommend the Shrimp & Grits, Sausage Penne, Lasagna and French Quarter (shrimp sauteed in Alfredo sauce with red bell peppers and green onions). The Southern Pot Roast and Hot Brown made the cut, as did 17 sides. Six Pizzas include their Margherita (tomatoes, mozzarella, parmesan, basil and black pepper), Dragon (chicken, salsa, cheese, jalapeno, red peppers), and Roast Garden (peppers, zucchini, onions, mushrooms, tomatoes, spinach and mozzarella). A Sandwich page features Crab Cake, Prime Rib, and Stuffed Grilled Cheese. Save room for Dessert : Bread Pudding, Ice Cream Pie, Red Velvet Cake and Cheesecake. The Lemonade is great, as are the Teas and Fruit Drinks. If we're going to send you an hour up I-65 it better be a very special restaurant. It is. Tony York's in Glendale is the best within an hour of Bowling Green and one of Kentucky's Top 10. It's in the 1883 depot. It burned to the ground in 1931 and 2008, so even though it's been rebuilt twice to match the original,it's no longer a historic building. But the food is definitely worth the drive. The menu rotates, but on Saturdays you can get the $10 lunch special, an array of German Jager Schnitzel, Spinach Lasagna, Mixed Greens and Soup, usually a tomato bisque. Tony prepares his lasagna quesadilla style, as six stuffed triangles, lending a more delicate flavor and texture. Other items are Classic Kentucky : Fried Green Tomatoes, Chicken Livers In Milk Gravy, Cream of Spinach Soup, Reuben on Rye, Ginger Chicken, Hot Brown and Sorghum Glazed Pork Loin. Or try the Shrimp/Scallop Pizza. The House Salad includes candied apples, mixed greens, roast peppers, feta, sugared pecans and citrus balsamic. 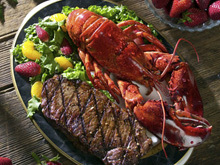 The dinner menu adds Shrimp & Cheese Grits, Seafood Bisque, Ribeye, Lobster Tails, Grouper Diablo, Country Ham, Veal Picatta, Chicken Cordon Bleu and other seafood, chicken and meat entrees. 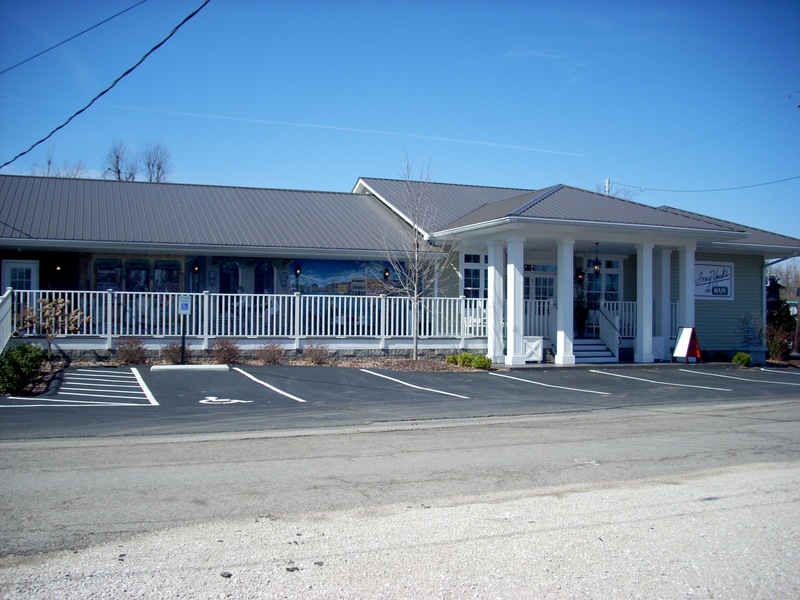 Walk ups can get a lunch table, but make reservations for dinner (270-369-6000) , as people drive in from Lexington, Louisville, Nashville and Indianapolis.